Sometimes you just work with what you have. 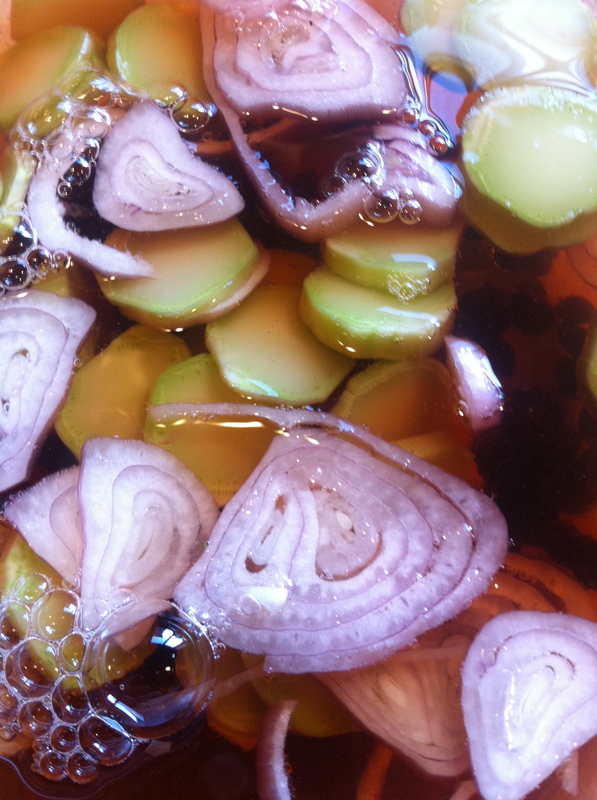 For instance, the first agenda item was to create a pickling brine. 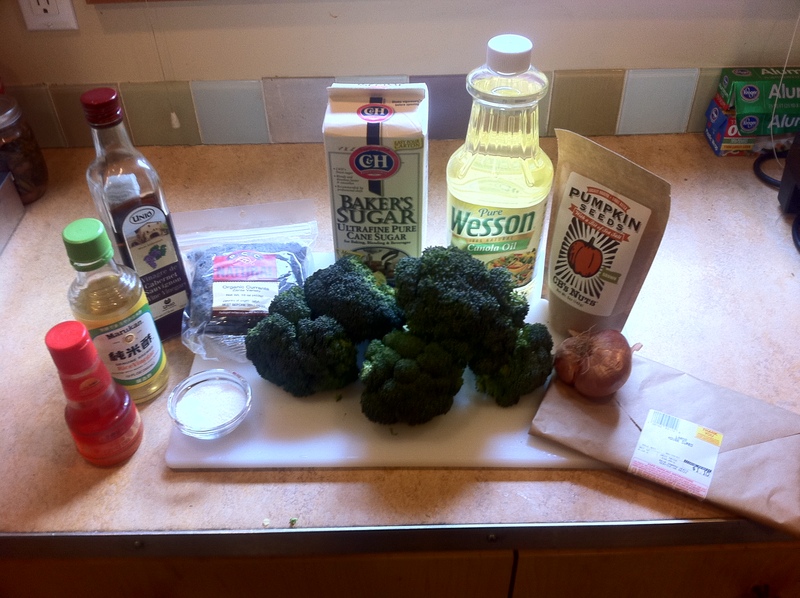 This required water, sugar, salt, rice vinegar and sherry vinegar. Mm, let’s see here: I have apple, balsamic, grape, red wine, rice and Cabernet Sauvignon vinegars, but no sherry. I do have a bottle of fino sherry, but it’s not a vinegar. Do I really have to go out and buy another vinegar just for this recipe? I decided to change the flavor profile a bit and went with the Cabernet Sauvignon. I only had baker’s sugar on hand. Is that OK? Oh, why not. I mixed the ingredients together, brought it to a simmer, then pulled it off the heat. Brine accomplished. 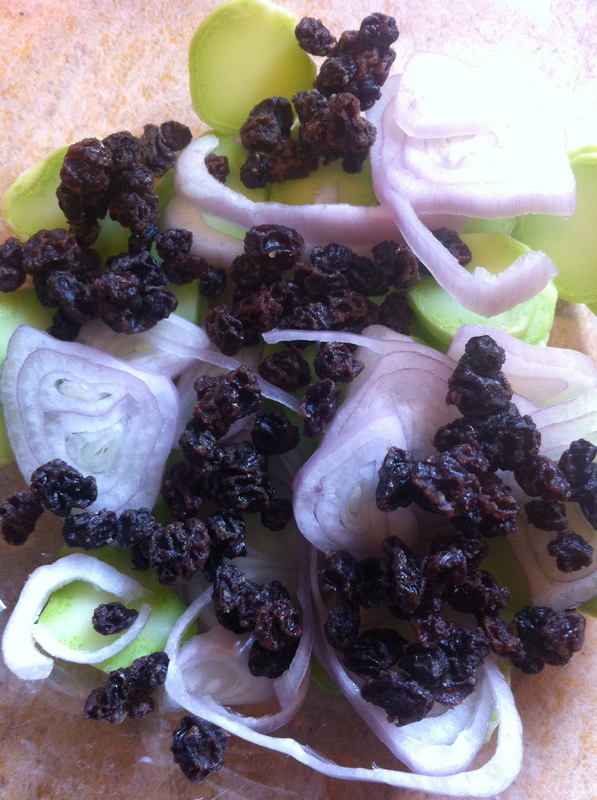 Next I chopped up a broccoli stem, some shallots, added some currants and poured the brine over the whole lot and set it aside to let it do its pickling thing. Next up was straight foward. 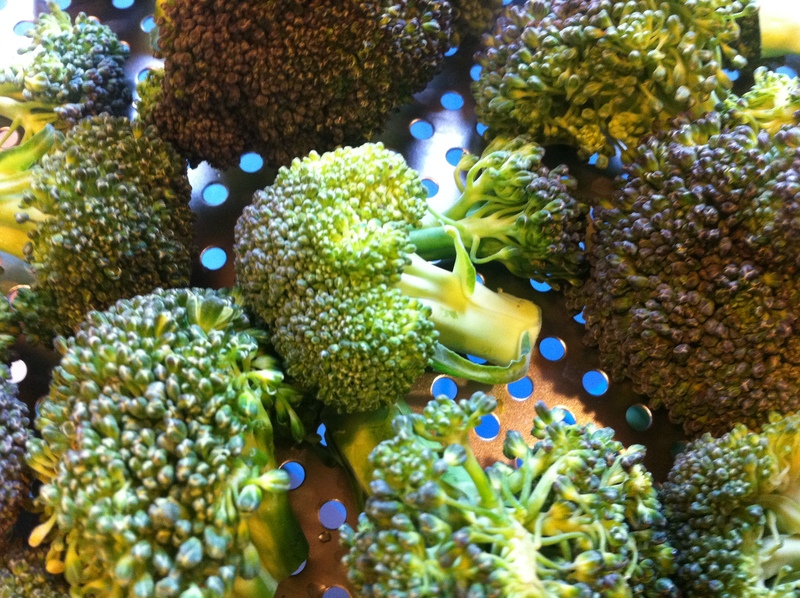 I took some broccoli florets and steamed them in the combi oven for eight minutes at 90C/195F. I then took some smaller florets, mixed them with some oil, and fried them in the combi with 0% humidity at 450F, the highest my oven will go. The recipe says 520F, but you got to work with what you have, right? I kept them in a little longer. 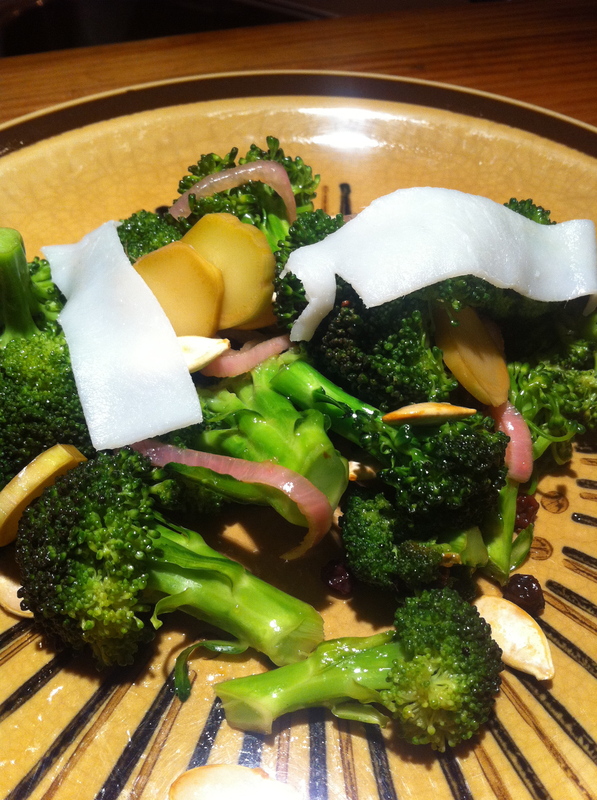 Salting to taste, the broccoli and pickled veggies were combined with a little chili oil and roasted pumpkin seeds. I added the brine to taste and draped some strips of lardo over the dish. I probably should have bought raw seeds and toasted them myself. I probably should have checked the ‘see page 230’ on the chili oil but I had some sitting in my fridge. Shortcuts? I suppose. Did it work? Oh yes it did. The most interesting thing about this dish for me was the combination of textures. You have the crunch of the pumpkin seeds, the chewiness of the currants, the soft snap of the broccoli and the creaminess of the lardo all interacting. There was the sweetness of the currants, the tartness of the pickled veggies, and the light background heat of the chili oil. This is a really great dish. The photo of it in Modernist Cuisine showed they added what looks like yellow and red peppers to theirs as well, although peppers aren’t listed in the recipe. I suppose it just shows you can modify as you wish, and it gives me a convenient excuse for changing up the recipe myself. 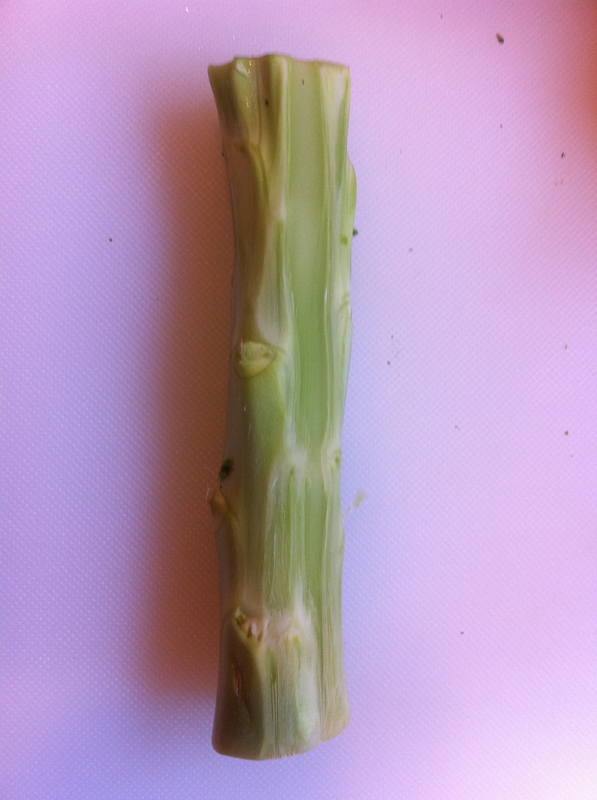 Maybe it should be called Broccoli Many, Many Ways. It’s been awhile since I spherified, but my experience is that the mixture should be ‘snotty’ before dropping it into the calcium chloride water bath. For blogging we use WordPress – works like a charm with little to no fuss. Happy Gastroventures to you as well! This looks great, I am giving this a shot tonight so hopefully mine works out as well! I am serving it along side the mac and cheese from the cook book and I can not wait! Nice! Sounds like a killer dinner – have fun! A combi oven is short for combination oven. It’s a convection oven that allows you to not only speed up the cooking process but also adjust the oven humidity conditions by injecting steam in the cooking chamber. Because the oven is capable of very low heat as well as high heat allows you a multitude of capability including frying.